We acquired "Christmas" in June. She was slated to be butchered along with her brother, but the previous owner was suspicious that she might be pregnant and gave her a stay of execution. Instead, we got Christmas in exchange for our butchering services. We all thought that she was due in about 2 weeks, but those 2 weeks went by and then a month, and we all gave up hope. Oh well, she would still make a fantastic Christmas meal. "Se la vi". Then a couple of days before vacation, we noticed some changes - things in the back end started to swell that hadn't been swollen. Then swelled some more. Mammaries started to hang, then swing as Christmas walked. We turned to each other and confirmed that she hadn't looked this way last week. Times were definitely a chang'in. We prepared a special birthing area away from the other pigs and put Christmas inside the day we were supposed to leave for the beach. It didn't take long. Within hours Christmas was panting and obviously uncomfortable - sitting, standing, sitting, standing. Classical pregnant female stuff. Scott offered to stay and babysit, but I was adamant that we were going to take some time away. We called the breeder who raised Christmas to get some advice. She told us not to worry. 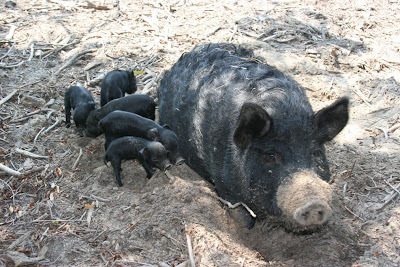 American Guinea Hogs had been birthing piglets without human help for years and, most likely, everything would be fine. We went to the beach and tried not to think about it. That was Sunday afternoon. Monday morning, with my full support, Scott returned to the farm to check on Christmas. 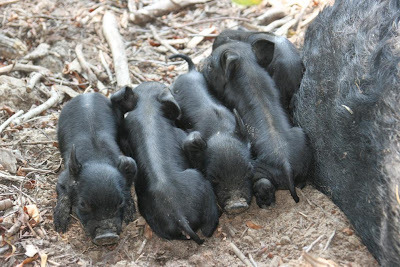 Sure enough, 5 perfect little baby pigs were hanging out with Mom. Due to the condition of their umbilical cords, Scott surmised that they'd been born just that morning - 3 boys & 2 girls. One female was a runt and, according to Scott, was about the size of a stick of butter. All were healthy. Christmas is an amazing mom. She feeds her babies what they need, when they need it. Nothing more, nothing less. She roots a hole in the ground (or in the hay), lays down and lets them feed about every 4 hours. She feeds until they've had enough. When she's not feeding them, the piglets either sleep or beg for more food. Unlike human moms, Christmas is not swayed by their begging. She lays down with her belly protected, and she goes to sleep. The first week I was worried sick that the runt wouldn't make it. She was so small and didn't even beg much. Often she would bury herself in the hay while they other piglets made sneak attacks to get milk. All the same, the runt seems to be doing fine. She gets her milk every 4 hours, and she's already doubled in size. Christmas has paid her no more mind that the others, and our little runt has responded by being exactly what she is - a happy little piglet in a happy little world. I think we humans could learn a lot from Christmas. Give your kids what they need. Teach them what they need to know. Ignore them when they want that which is excessive. Hmmmm. 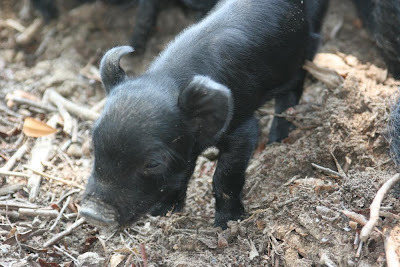 More on baby pigs later.